I took two trips by airplane this year. The first was to Cincinnati in February and the second to Atlanta last week. I’m always looking out the window as I land, trying to feel the city below me. In February, I was captivated by the colorlessness of the Cincinnati landscape in winter – from the plane, there was only white and black below me, nothing else. Atlanta, by contrast, was a solid wall of green. I had expected autumn, but it was like going to a dense rainforest of trees and lianas. 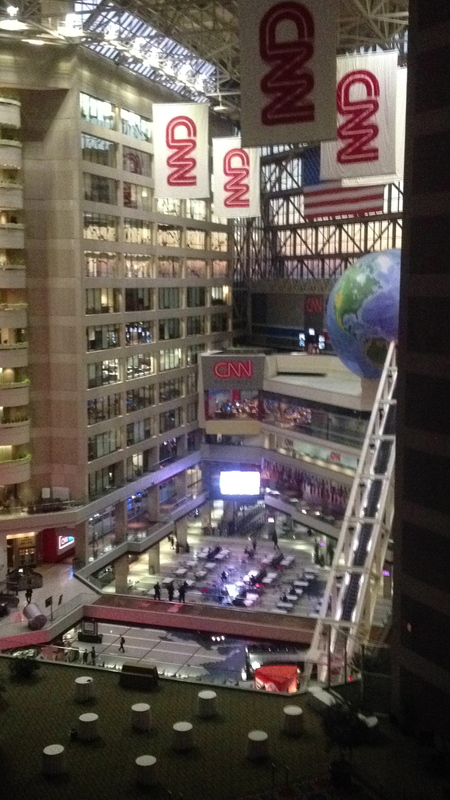 My room opened onto an atrium and my balcony overlooked CNN world headquarters. I should have brought my binoculars, because try as I might, I could not catch a glimpse of Anderson Cooper. I went down to the Starbucks kiosk in the lobby and tried to see famous people, but I came to the conclusion that they have minions to fetch coffee for them. Conveniently, they have a dry cleaners down there in the lobby, which must come in handy for pressing Anderson’s black t-shirts when he’s out visiting a war-torn country. There’s a giant CNN gift store, too, but if I were going to buy gifts for my news junkie friends, I think they would come from the NPR shop, not CNN. I’m snobby that way. Sorry, Wolf Blitzer. That glowing spot is a giant – it must be 30 feet across – TV screen that blares CNN – what else?- 24 hours a day. It’s a little annoying – like having a motel room next to an annoying guy who never shuts the TV off. So much for the fancy-schmancy – I have had quieter stays at the Best Western by the interstate. At least the room rates are pretty good – I just checked – $129 a night and up. It’s certainly centrally located, especially if you have an interview at CNN. I just hope for your sake that it is with Anderson Cooper and not Nancy Grace. Our anniversary is in January – not the best travel month. One time, waiting till the last minute to make plans, we just picked a city with an available timeshare trade – Atlanta. Of course it turned out to be the coldest January on record, and Mike had icicles hanging off his mustached, but we loved the city! I have heard it can get terribly cold there! Hard to believe – it was still summery last week.